In the middle of Duluth, Minnesota is a unique 117 acre park that is called Chester Bowl because Chester Creek flows through the park and the hills on three sides of “the bowl” provide for skiing in the winter months. A scenic overlook provides a great view of Lake Superior and great views of the beautiful city of Duluth. The park also has exciting youth programs, hiking trails, fishing and soccer fields. In the summer months on Tuesday evenings, music fills the park and provides an opportunity to meet and greet people and enjoy great music and entertainment. 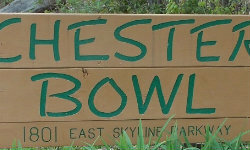 For 32 years the City of Duluth Parks and Recreations Department and the Chester Bowl Improvement Club sponsor the summer concerts. The music starts at 7 p.m. each Tuesday evening. This year the concerts begin June 3 and continue through August 5th. It kicks off with the Chmielewski Funtime Band on June 3rd. June 10 the Lake City Smokin Section performs. June 17 features Charlie Parr. The Fish Heads will perform on June 24th. July 1st the concert will be performed by Saint Anyway. I can’t wait to hear the Rock a Billy Revue on July because I love the “oldies”. July 15th is The Formal Age Band and July 22 is the band known as Sound Incorporated. Busterville Band will be performing on July 29th. The well-known Pot Bellied Stallions will steal the final show on August 5th and August 12 and 19th are rain dates if needed. Make your plans to be in Duluth Minnesota this summer and take in a Chester Creek Concert! From the Author: I love to sit on the back deck of The Firelight Inn on Oregon Creek Bed and Breakfast on Tuesday evenings and listen to the great music! Often on Tuesday evenings the music from Chester Bowl, that is just about one mile from our Inn, can be heard in our front porch! Plan your stay with us this summer and enjoy a Tuesday night Chester Creek Concert!